Guinness opened its new taproom in Baltimore earlier this year. The Open Gate Brewery & Barrel House was meant to be a destination, but also more than that, a very American extension of one of the world's most recognizable breweries. The brewery just announced the release of its first new, bottled beer out of the Baltimore facility. Brewed in Dublin, and barrel-aged in Baltimore, the transatlantic brew is its Antwerpen Stout aged eight months in Bulleit Bourbon barrels. It bridges the history of the beer with an increasingly popular style. 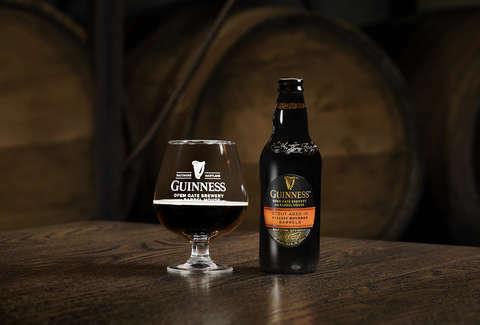 "Our story as brewers began more than 250 years ago in Dublin, and those Irish roots will absolutely always be a key part of who we are, but beer has evolved in so many ways since then," said Emma Giles, brand director at Guinness. "It's hard to deny that the U.S. is the center of the universe as far as beer innovation is concerned. Now that we have a permanent home here with some of the most talented brewers the country has to offer, the potential to blend our brewing expertise with American creativity is virtually endless." The beer having been aged in Bulleit barrels should come as no surprise. The Baltimore facility was formerly a distillery owned by Diageo, a company that also counts Guinness and Bulleit among its portfolio. That gives Guinness ample access to barrels from popular brands like Bulleit. "The best part about barrel-aging any beer is that you get the chance to pull the flavors of the wood and liquid previously aged in it," said senior brewer and former Stone Brewing brewer, Sean Brennan. "We've already started to think about what we'll be experimenting with next, but we couldn't be more pleased with our first go at using barrels from our friends at Bulleit. This beer is something special, and one to be sipped slow and savored." The barrel-aged brew hits shelves across the country "in a very limited supply" starting Friday, November 16, in addition to being on tap at the Open Gate Brewery through the end of the year. It's not just the style that will seem familiar to beer nerds, but the price as well. Four packs of the 10% abv beer have a suggested retail price of $19.99.